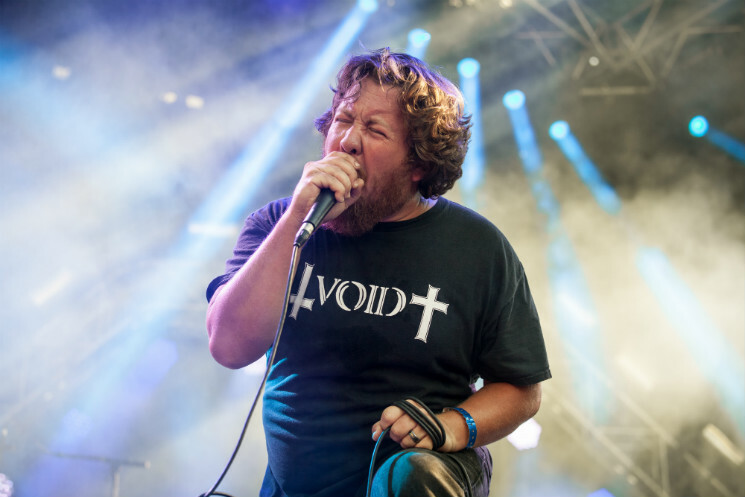 Tucked away from the main stages in Parc Jean-Drapeau, Virginia grindcore outfit Pig Destroyer pulled no punches in affirming that their legend status within the genre was all but cemented, filling 45 minutes of stage time with short bursts of unbridled aggression. The group's two core members from their inception in 1997, vocalist J. R. Hayes and guitarist Scott Hull, were nothing short of commanding in their respective roles. Hull attacked all seven strings of his extended range guitar without restraint in chugging out his signature riffs, while Hayes pushed his forceful bellow to its breaking point throughout each song. Alongside bassist John Jarvis and electronics master Blake Harrison was drummer Adam Jarvis, incredibly precise in laying down a whirlwind of blast beats and speedy double-kick from behind his drum kit, without breaking a sweat. A good chunk of the set was dedicated to refreshing the crowd's memory of the 2001 landmark release Prowler in the Yard, with the crowd relishing performances of "Trojan Whore," the eerie text-to-speech tale of "Jennifer" and a roaring finale that included "Hyperviolet" and "Piss Angel," the latter of which Hayes introduced as "Whole Lotta Love" in a deadpan tone.